The Voluntary Guidelines for Securing Sustainable Small-Scale Fisheries in the Context of Food Security and Poverty Eradication (SSF Guidelines) were endorsed at the 31st Session of the FAO Committee on Fisheries in June 2014. The SSF Guidelines will only be effective if they are widely known by stakeholders and systematically applied in accordance with the guiding principles they establish. To support the implementation of the guidelines, a Global Assistance Programme (GAP) was established. 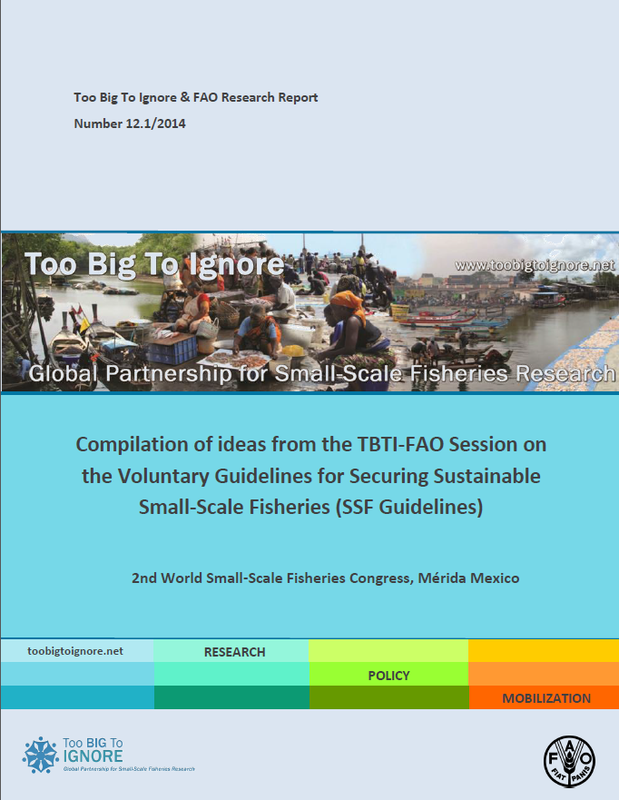 FAO, in collaboration with the Too Big To Ignore project, organized a special session at the 2nd World Small-Scale Fisheries Congress in Merida, Mexico, September 2014. The aim of the session was to inform the participants about the SSF Guidelines and gather participants’ recommendations and inputs to the development of the GAP. 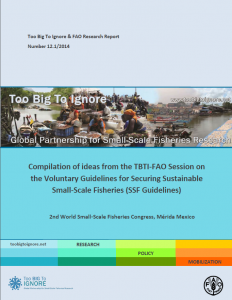 To view the recommendations, see Compilation of ideas from the TBTI-FAO Session on the Voluntary Guidelines for Securing Sustainable Small-Scale Fisheries .